Do you love fashion shopping? 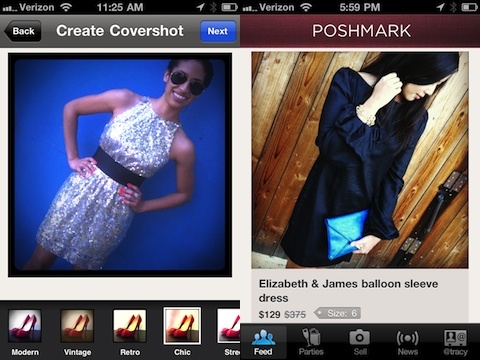 Download the Poshmark application for your iPod touch or iPhone. 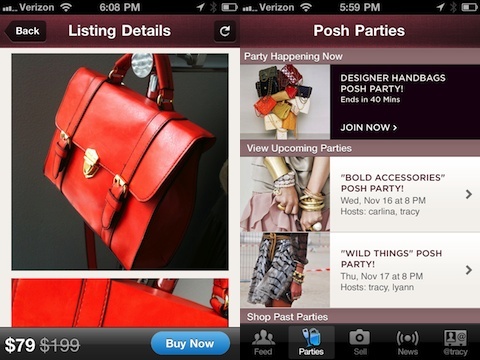 This free app lets you both buy and sell your personal fashion clothing. Attend a fashion party virtually, sell clothing and accessories from your closet easily and browse stores safely thanks to the Poshmark Promise. You can also connect with people who are in the Poshmark community to talk about style and your love of clothes. Everyone has items in their closet that are in good condition but that just aren’t getting worn or used. Instead of holding a garage sale, you can sell these items via Poshmark. This app makes it easy to get your Spring cleaning over and done with. And since you’ll want to replenish your closet once you’ve weeded out your unwanted pieces, you can purchase items that you’ll absolutely wear in the Poshmark market. Plus, you’re bound to get a great deal just by shopping through Poshmark. This app makes organizing and cleaning a breeze, making it a great choice for busy girls who are on the go. If you have time to commit to a clothing party, you can attend one via your iPhone or iPad. Plus, parties have themes, so you can skip out on the ones you’re not interested in and attend the ones that you’re dying to shop at. For example, you may be dying for new accessories, which makes the Bold Accessories party perfect for you, and you can gracefully bow out of the Party Dresses gathering if you already have plenty of minidresses taking up space. Even if you don’t want to buy or sell any items right off the bat, this app makes window shopping and browsing a ton of fun – plus, it’s easy, and you can do it anywhere. You no longer have to be tied to your laptop just to cruise a few online stores. The Poshmark application’s interface makes it easy to view items in detail and it’s very user-friendly. It’s not difficult to figure out how to use or to click between buying, browsing and selling. The photos are colorful, vibrant and very clear, which means that you won’t have to worry about purchasing something you’re going to hate later on. And since you can see which parties are currently happening – and join them even late in the game – you don’t have to miss out just because you signed on mid-party. You can also see which parties are going to be held in the future, which means you can schedule them in your calendar and be ready to participate. Once you’ve gotten used to the Poshmark app, you can follow certain users who’s items you tend to like a lot. This way, you can stay up to date on items that are being sold and snag them up before anyone else gets to them. Overall, Poshmark is a unique and handy app for the fashion conscious user. AppSafari review of Poshmark was written by Darius Reimm on December 14th, 2011 and categorized under App Store, Free, Shopping. Page viewed 9192 times, 5 so far today. Need help on using these apps? Please read the Help Page. Poshmark? Some of the greatest deals and most amazing women you’ve ever met! It’s fun to buy, sell, trade, negotiate – and it’s soooo very easy! Thank you Poshmark! Much love being sent your way!! Very disappointed with purchase experience, bought the item, was waiting 10 days for it, and had to cancel because seller didn’t ship it. There is no guarantee that seller going to ship your item, so you can not actually expect something. There is no feedbacks, so you don’t know who you dealing with. Just waisting time. Ebay much better, can’t even compare. The owner of Poshmark is Indian and cheap. He won’t allow any refunds, and charges 20% per transaction. I don’t know why anyone would buy/sell. I’m deleting my account! How do you delete your posh mark account? I can’t find how. I absolutely LOVE Poshmark and have become addicted. I treat it like a business of my own. Although I go to school and work, Poshmark is fun and easy to use. I have met so many wonderful ladies so far and can’t wait to do business with you! ENTER THE CODE “HUJLE” when starting your account to receive $5 credit towards your first purchase! Buyers, sellers and traders – this app is for you! don’t use above code(HUJLE); incorrect code. Instead use “HSQJQ” to receive $5 credit on first purchase! Sorry for the inconvenience! HXLBK will get you a $5 credit! Use it as your invitational code! I would not recommend this app to anyone unless you like wasting time and money!! They have NO customer service, and the only way to communicate is by email, which they NEVER respond 2!!! Threadflip and tradesy is much better!!! I enjoyed Poshmark when I used it. I bought quite a few items until I got an email from ” Rebekah” saying that my buying pattern set off their fraud department and unless I give the my phone number so they could call me and verify that I’m the one making the purchases, they would suspend my account. I wrote back and provided the number explaining that I had fraud protection through my bank and if there was a fraud issue, my bank would have contacted them. I stated that had not happened. 72 hours went by and I got another email from poshmark ” Rebekah”, saying they were sorry they hadn’t called but could I now send a copy of my drivers license and debit card for verification so that my account, which was suspended could be reactivated. I wrote back saying I would contact my attorney and authorities and show them the emails and see what they thought about the situation. It seemed strange and very suspicious to me. I would strongly recommend not using this company for your own protection. POSH MARK LETS ANY SELLER SELL REPLICA’S. THIS IS ILLEGAL. I HAVE SENT THEM EMAILS AND REPORTED REPLICAS TO THEM AND THEY IGNORE EVERYTHING FROM ME. I HAD NO CHOICE BUT TO CONTACT COACH, BURBERRY, LV AND MANY MORE. THEY ALL TOLD ME THANK YOU AND THEY WILL LOOK INTO THIS ISSUE IMMEDIATELY. MY FRIEND SELLS ITEMS AND SHE GOT REPORTED IT WAS A REPLICA AND SHE PROVIDE RECEIPTS IT WASN’T AND STILL REFUNDED THE BUYER THERE MONEY BACK. THEY JUST DONT CARE ABOUT ANY OF THIS. Items are misrepresented and good luck getting your money back! I only bought one item and learned early,but you don’t have to search very hard to find sellers complaints over over the lots of different sites. wonder how may of the positive sites are either people who have actually not dealt with the company or ARE the company. My advice Run! Unless you like extra frustrating and drama in your life. I signed up with Poshmark on a phone I no longer have access to and wondered if there was a way to edit, list new items, etc from a different Iphone. Any help would be appreciated. I have a totally different Iphone not connected to the first user, what can I do to keep my closet intact while I make necessary changes? I highly recommend not downloading this app. Not only is it filled with rude people and scammers who will take your money and or items, but also the people who run the app do not care nor try to keep a user happy. I have had so many problems with this app it is crazy. First I took about a month adding all of my 100+ listing to the app and then took another couple months gaining followers. Once I hit my follower goal and sold my first item, poshmark restricted and deleted my account. Then when I tried to contact them and ask why and to add it back, they never replyed. Ever. Even though I sent 5 messages. Next, I got scammed out of my money by 4 people and each time they said they couldn’t do anything about it. ALSO. THEY CHARGE 20%. That is the biggest charge for a selling app I’ve ever heard. It is run by a greedy Indian or Chinese person who doesn’t care at all and just tries to rip people off!!! Poshmark has allowed me to make some extra money while cleaning out my closet! I find the app very easy to use and the Poshmark online community very supportive! I’ve also been able to find items that are sold out online and in stores at great prices! Been on Poshmark for nearly a year as both a seller and buyer and love it! Didn’t know what to expect at first, but it’s so easy to score fashion deals or make money from items you no longer wear – all from your phone. Overall, my transactions have been positive but I’ll share a few tips: treat everyone with respect, ask questions or for more pictures if a listing is vague and avoid trading or taking a transaction off Poshmark (ie Paypal) as that’s when most scams happen. Enter code JMAKZ to get $10 free when you sign up via the app! (Does not work from regular website! App only!) Plus enjoy .99 cent shipping on first purchase!